« Trip Barker now available in Cebu! The Land Transportation Franchising and Regulatory Board (LTFRB) signed an agreement with the BPO Workers Association of the Philippines (BWAP) and EACOMM Corporation to help ensure the safety of the more than 800,000 BPO workers in the country, most of which work during the night. 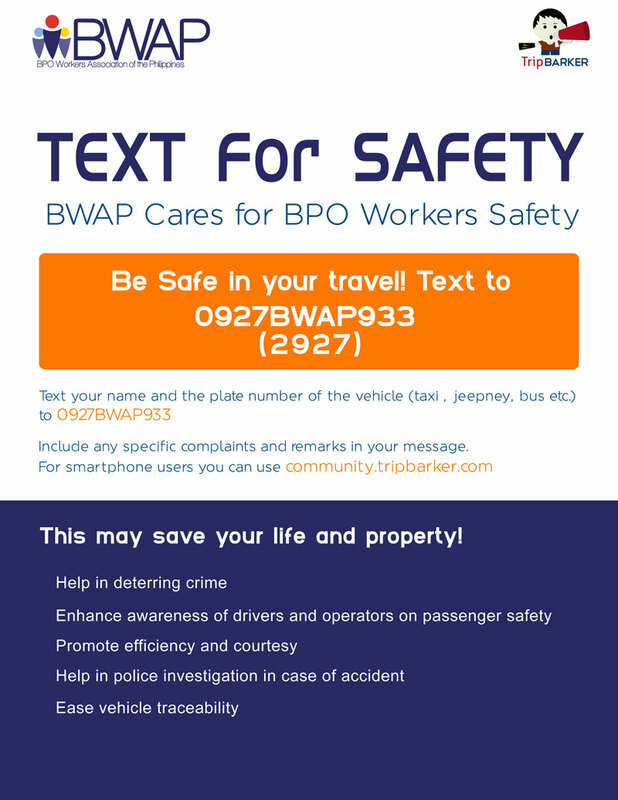 The BWAP Text for Safety Project aims to provide a simple solution in ensuring commuter safety by providing BPO workers a venue to store their commuting history through a centralized database. The worker need only text the license number of the vehicle he/she is riding in to 0927 BWAP 933 (0927 2927 933) along with his/her name. If the worker is mistreated, or was involved in an accident or criminal act, he/she need only request back the information logged in the system and BWAP will help report the incident to the LTFRB or to law enforcement authorities if need be. For workers who have an android smartphone, more detailed complaints or concerns may be lodged with Trip Barker‘s “Bark It!” feature which allows users to report on accidents, complain against erring mass transit drivers, etc. Complaints are posted in community.tripbarker.com and serious issues are forwarded to LTFRB, DOTC, and other government agencies. “As mandated by the Department of Transportation and Communications (DOTC), we are to ensure the convenience and safety of the people when they travel the metropolis, hence this agreement is very timely and highly relevant to our road safety campaign,” LTFRB chairman Winston Ginez said. The Text for Safety Project was formally launched on April 30, 2014 in anticipation of Labor Day 2014. Tagged bpo philippines, bpo workers association philippines, bpo workers philippines, bwap text for safety, ltfrb, outsourcing philippines. Bookmark the permalink.